It's so simple yet so powerful and has literally saved me hundreds of hours and untold gallons of frustrated, angry sweat. 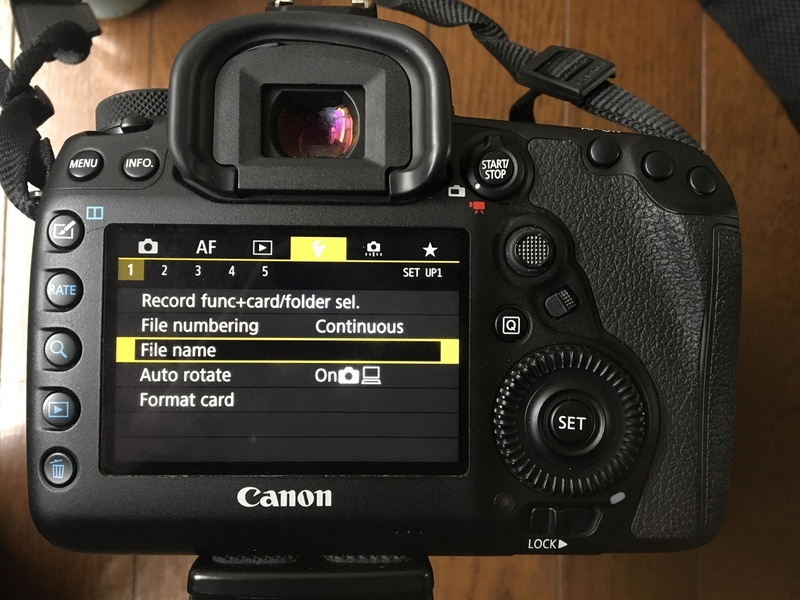 If you want to know a quick, fast camera hack that can make your photography life a rosy ride of comfort, then keep on reading. Just recently I wrote about what gives me meaning and satisfaction in photography: being outside shooting in solitary isolation. I'm not an indoors person at all, and I drive my poor wife crazy with my constant need to "be outside". What that means in the context of this article is that I wasn't blessed with the meticulous tendencies of a shrewd accountant and I may well be the world's worst file keeper. That's not a particularly great trait when you're a photographer dealing with hundreds, if not thousands of photos from shoots over a span of days. 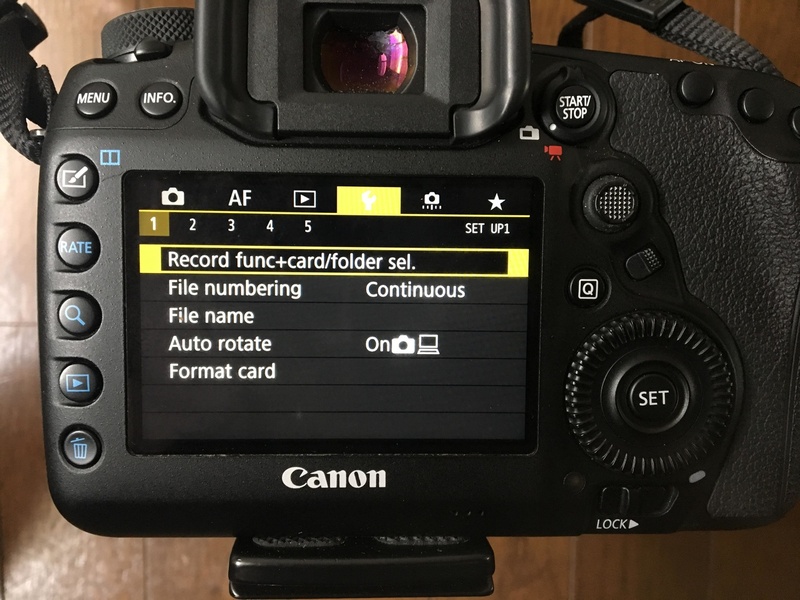 I tried to find ways of organizing my files more efficiently, but nothing really worked, and I ended up getting incredibly frustrated at the time I was wasting trying to locate files and shoots and folders, until I found a very simple workaround that I want to share with you today. It has saved me so much angst and time and allowed me to focus on the things I really love about photography: shooting and editing. 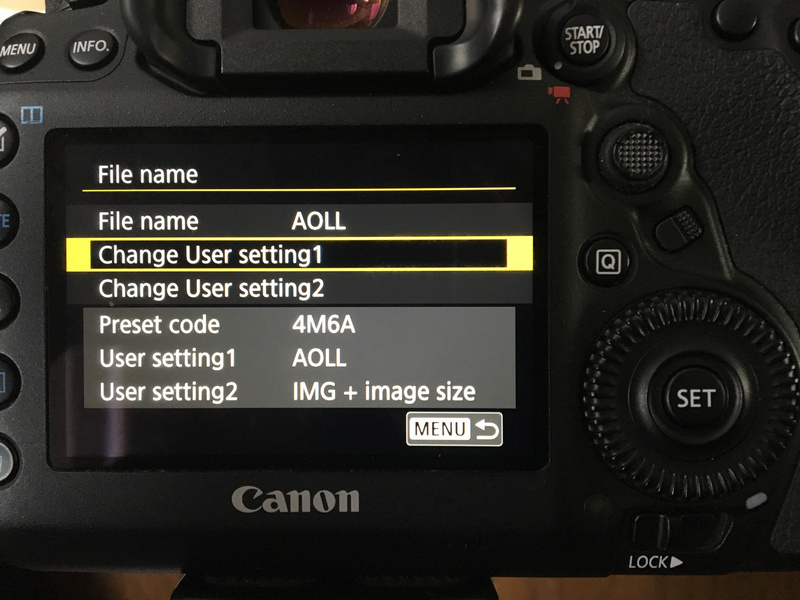 I am a Canon user, so the following photos apply to a Canon menu, but I'm sure you can relate or find parallels with your own system. If not, just sit back and chortle. When you're trying to organize files in the Canon menu, this is the first thing you'll see as you scroll through to the yellow section. Initially, when I embarked on my quest to become a better file-keeper, I thought it'd be a grand idea to create new folders every time I went out for a shoot. So, that's what I did. The night before a shoot (if I was uber-organized) or most often early on the morning of a shoot after four coffees, I'd scroll to the yellow menu and create a new folder for that day's work. It was genius, and it compartmentalized all my shots and kept them away from confusing each other. In theory, it's great, but this is what you're left with as you create folder after folder. Of course, if you're viewing the shots in camera, you get that nice little thumbnail on the right to show you the shots included in that folder. But when you're at the computer and you slide your little SD card into the slot, this picture below is what you invariably get. 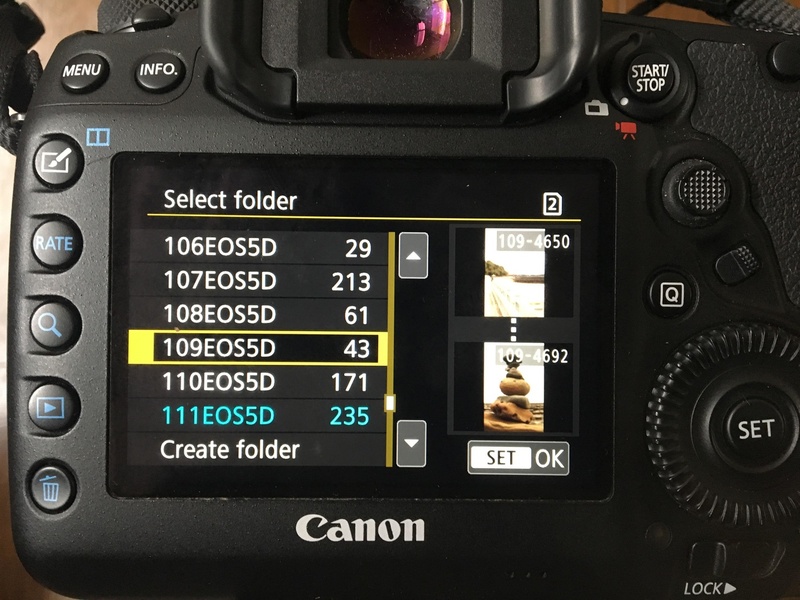 Now I'm not sure about you, but seeing 100EOS5D; 101EOS5D, 102EOS5D and so on ad infinitum isn't particularly helpful when I'm trying to work out what I'm doing and what I'm about to edit. The more organized among you might be thinking "why don't you just rename the folders when you transfer them to your hard drive?" and that's a great point. But I'm a dad with a 2.5-year-old daughter and a five-month-old daughter. I work full time at university here in Japan and I take photos (or surf) in the time I have to spare. All this means that I often don't have time to sit at a computer and wait for my files to transfer before I can rename them. I like to stay outside until the last seconds I'm due to bathe my girls in the evening, then it's dinner and book-reading and all manner of other things, which means I sometimes don't get around to transferring files for at least a few days or more, by which time I often have four or five folders from consecutive shoots that need to be transferred. 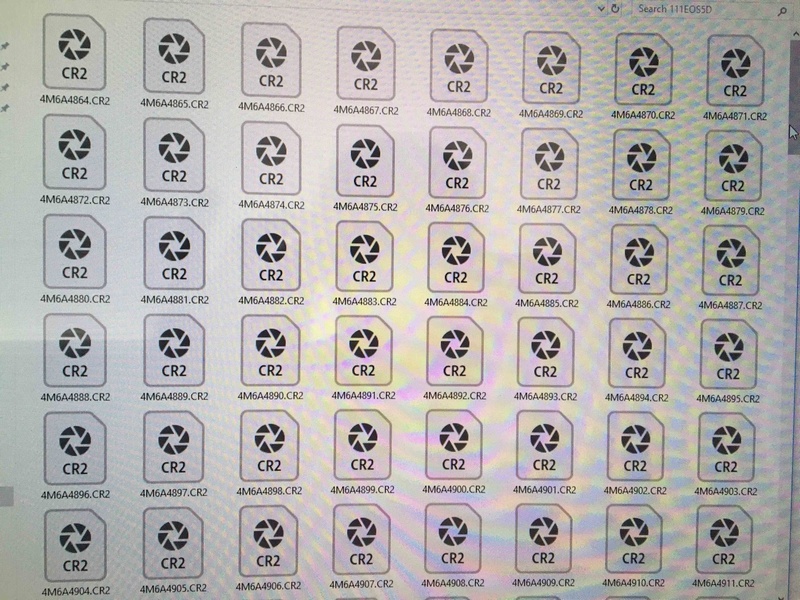 This can amount to 30-40 minutes of sitting around before I can rename files — a luxury I don't have, sadly. So, when I finally do get around to transferring files to my hard drive, I'm often faced with this picture below. I don't know why, but it seems the newer SD cards that I've been using recently don't provide a preview of the raw files. Terrific, huh? I get a screen full of these, which are absolute gobbledigook to me and mean diddly squat in terms of helping me identify what shot is in what file. 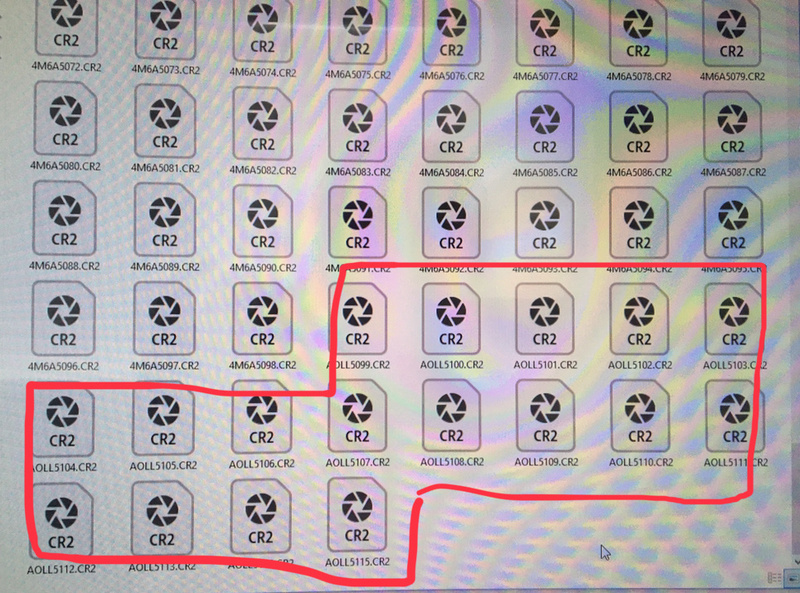 So then, in order to see what these files actually represent, I need to double-click on one. If Photoshop's not open, I need to wait for it to load so the Camera Raw editor can open. Oh the irony of Photoshop's new home logo: it's exactly how I feel at this ridiculous palaver. So then I get to see what the files are, but I need to make a few clicks if I've taken various shoots in a single folder. That's because I need to see where one shoot ends and another begins in order to organize my files a little better. It's painful reading, isn't it? As this continued I was faced with a dilemma. Stop taking on work and getting snowed under with file-keeping or find a better system. Surely, there had to be a better way than this painful dance? Thankfully, there is. After a lot of searching and testing, I've found a workaround, a hack if you will, or what I believe is my most important lifesaver to date (there have been many). Instead of creating new folders each time I go out shooting, I now just leave every shot inside one, single folder and rename the files before I go out shooting. Change the file name, not the folder name. 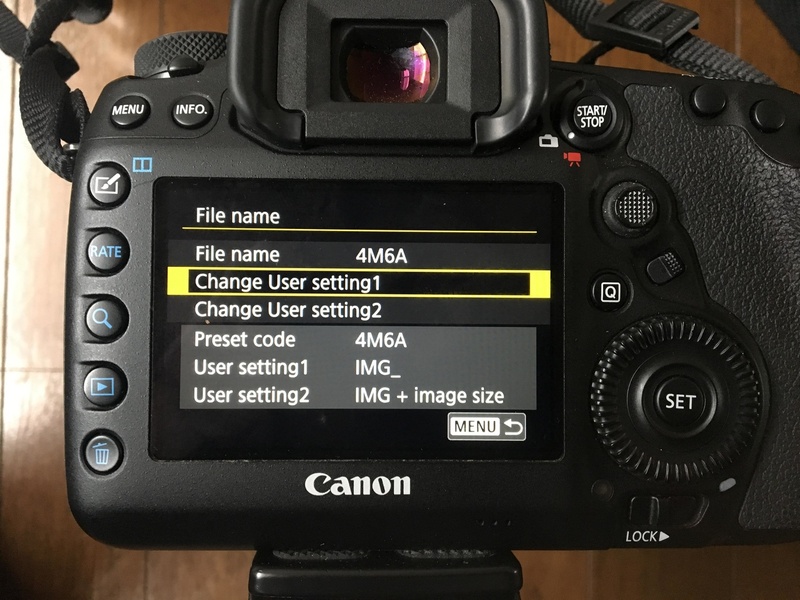 To do so on the Canon 5D MK IV, you go to the same yellow menu space, but instead of clicking the first option, you click the "File Name" option, or the third one in the list, as you can see from the picture below. 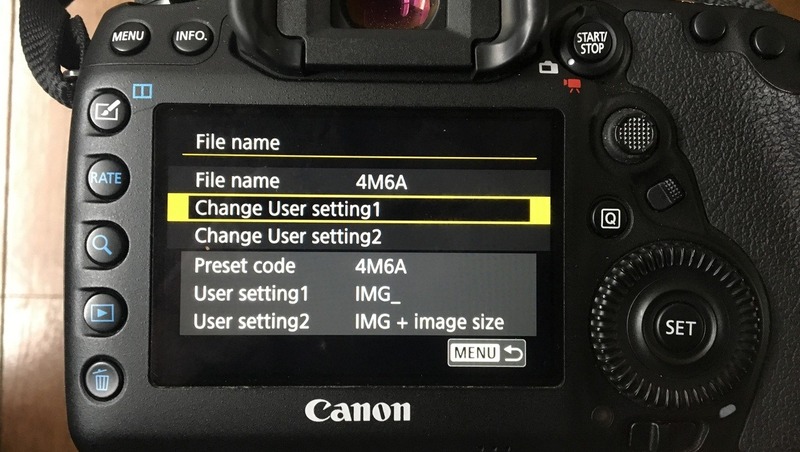 Once you click that, you then scroll down to the second option, which says "Change User setting1" as seen in the image here. 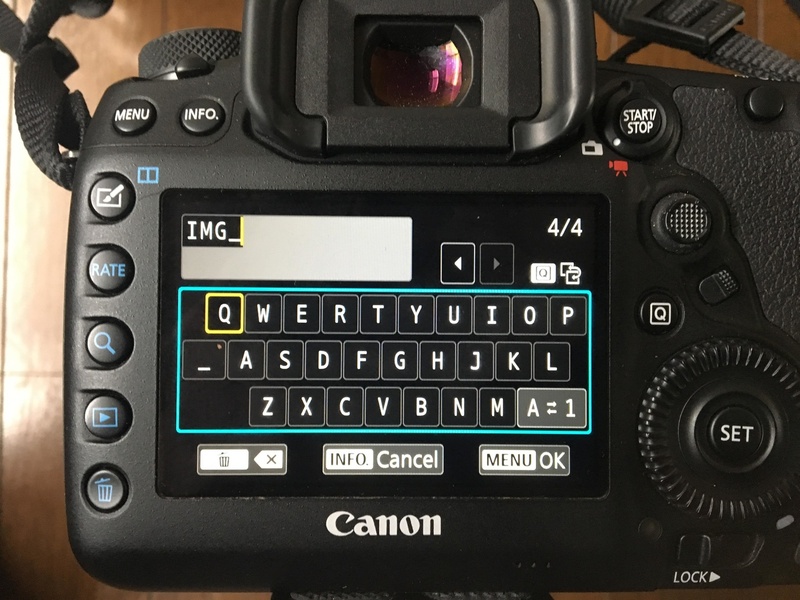 Once you've clicked that, you can type in 4 characters (numbers, letters, symbols — whatever helps you remember your shooting scene or scenario). It means you can get rid of the default IMG_ and put in something that's far more relevant and easy to remember. In the example below, I have typed in AOLL. This means "Aoshima Leading Lines" (AOLL) which is a shoot I did at a gorgeous little island here in Miyazaki that has an amazing volcanic rock setup that leads to a lighthouse. So, while I was out shooting in Aoshima, every photo I took was automatically labeled AOLL inside the camera's folder. You can double check that you've input everything correctly by checking "File name" in the yellow menu space. Here, you can see it says "AOLL". The beauty of this system is that, firstly, you don't need to create new folders every time you go out shooting. And secondly, you don't have to worry about getting to your computer quickly to organize your files before you forget what they all are or which folder they're in. You can see in the image below that all the photos I took on the day out at the Aoshima lighthouse are marked with AOLL. Then, the next time I go out shooting, I just change the file name to something more appropriate, and I'm good to go. Sometimes, when I'm busy with photography work, I can do multiple shoots in multiple scenarios before I even lay eyes on my computer. Doing it the old way meant I was always playing catchup and chasing my tail because neither the folder names nor file names meant anything to me. 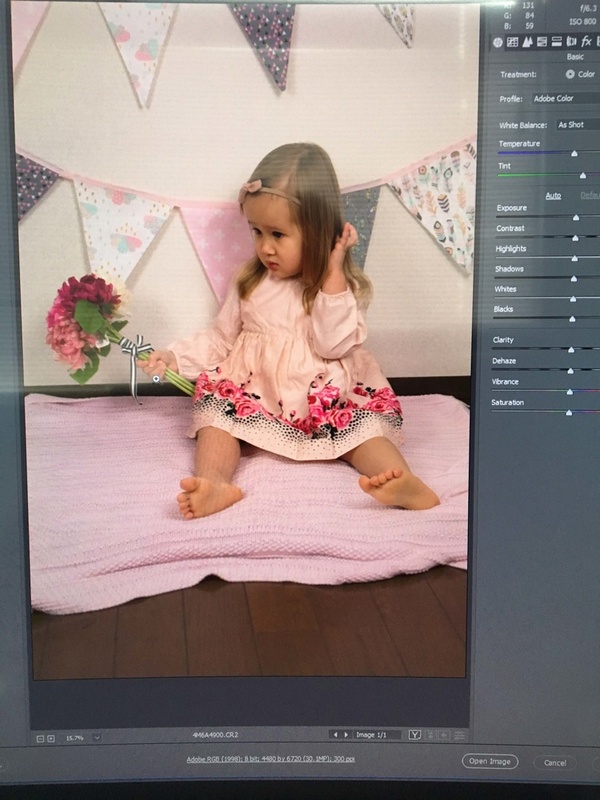 And without being able to see the thumbnail previews, it was excruciatingly slow trying to manage it all, and I literally missed out on dozens of early morning shoots because I was trying to manage files for clients and keep everything efficient. Now, I don't need to do anything to stay organized. I can shoot as much as I want and not transfer photos onto my hard drive for weeks if my heart desires, as long as I change the file name in camera before each shoot. 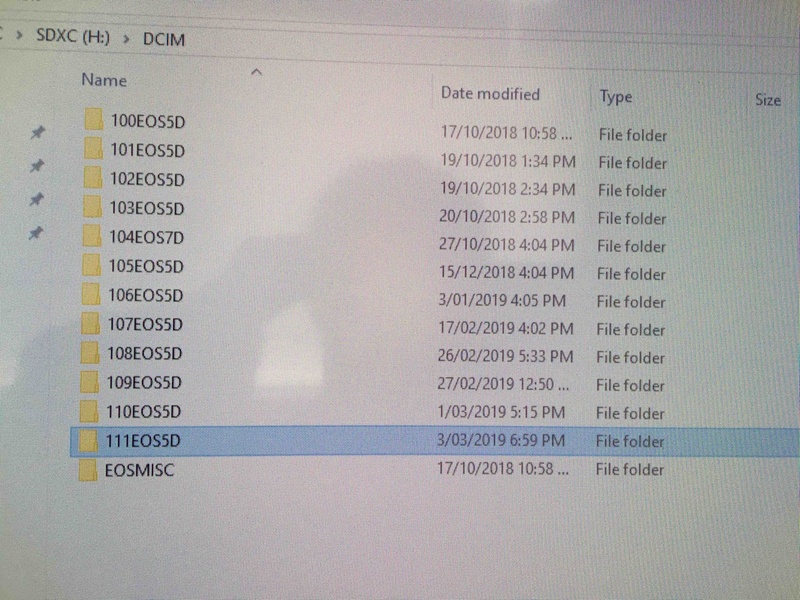 Then, when I finally do get around to sliding the SD card into my PC slot (usually when I've maxed out the space) I can easily find all the files and quickly recognize exactly what they are and identify and organize them with ease. Far beyond any gear purchases I've made in the last year, this change to my file organization approach has been the biggest help. 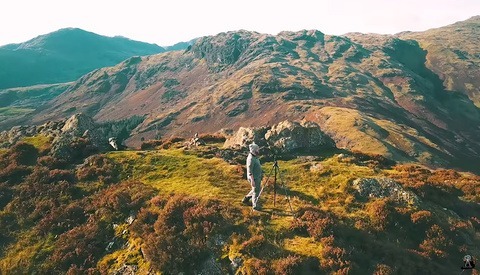 It saves me time, it saves me stress, it helps my workflow, and it allows me to focus on everything that's good about photography: taking photos. 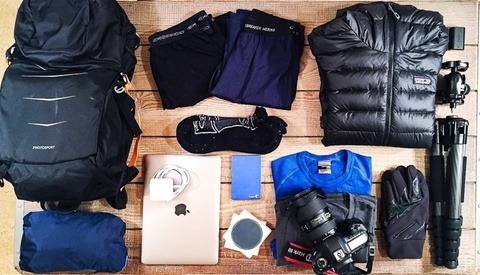 Have you faced similar issues trying to organize the thousands of photos you take? Do you have a more efficient system that could help even further? I'd love to hear about your trials, tribulations, and successes in the comments below. MS Solution. Camera vendor may have their own, more up-to-date, version. Microsoft Camera Codec Pack (only included the Canon models here. Check link if you want to see other camera models. I used to have FPViewer but, although it did get the job done, I had to uninstall it. It is just annoying when it tries all the time to take over other image viewers. There are simpler things. I use Photo Mechanic. Priceless as you can create everything with their variable parameter system and it's quick as hell. So define once an you're ready to go. Thanks Bert, I’ll certainly give it a look! I just stoped over to say that Windows has a feature called "Snipping Tool" that will let you take clean screenshots, without the moire' and phone-holding shadows, when you need to show your screen to others. Cheers Greg. I’m familiar with the Snipping Tool and use it a lot. What are you suggesting I use it for in this context? I think you idea has merit. My last overseas trip (6 weeks) I was traveling between two countries went to 4 all up. When I got home it took a bit of time to put these photos in the country folder, the photos were geotagged which was the only way I could find which country they were taken in. Your idea would have been have saved me so much time. Cheers, PS my next trip is to Japan lol. Thanks. The thing I like about this method after using it for a while is that you can get even more specific with your naming. So, in your example, let’s say you went to USA, Mexico, Canada, Panama. Then you can start the filenames for USA with U. Then if you’re in Grand Canyon it could be UGC or something. Then in Vancouver, it could be CVAN etc etc etc. 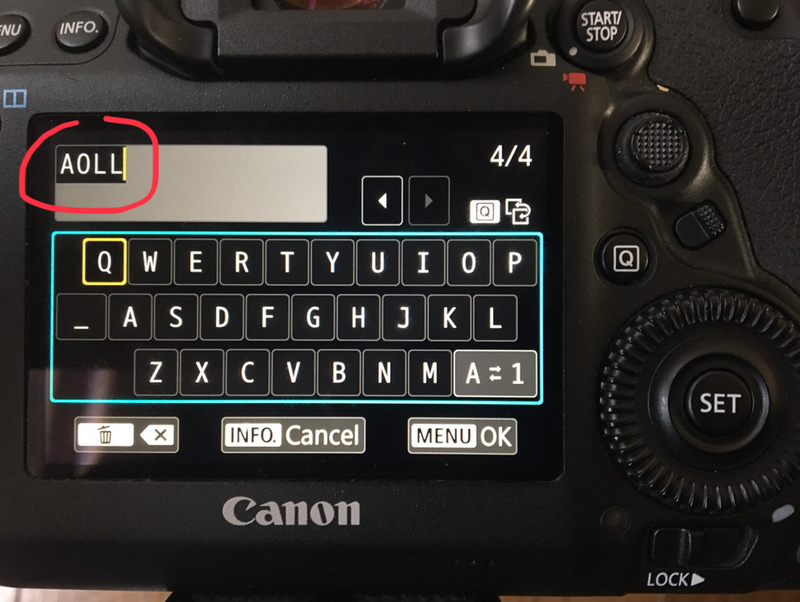 It takes me 30 seconds total to do this in-camera but saves me so much time when I’m trying to sort thru my SD cards and files at home. And if you come to Kyushu, please let me know! Good idea with the place naming. Would speed things up. I know a bloke who travels a lot and I mean a lot and he uses Fast raw viewer (you may know of this) if not take a look. Thanks for the offer, love to take it up but I am going to Hokkaido, Kyoto and Tokyo then home. 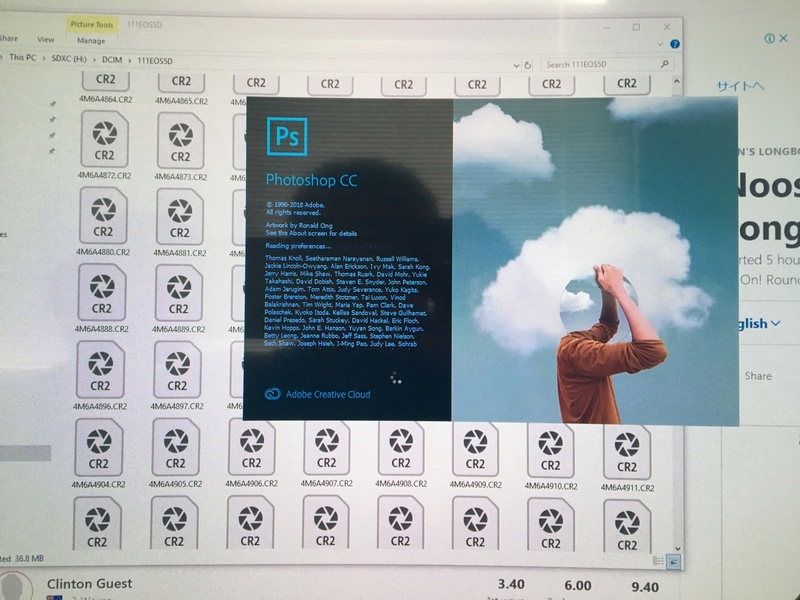 If you transfer your images to computer with Adobe Bridge, you should be able to see thumbnails before the transfer starts, including for your RAW files. You can rename files before transferring, and have Bridge transfer two copies of each file to different folders, ideally on different drives, so you get a backup copy along with a working copy. It does take a little longer than transferring only one copy, but is likely faster than doing two separate transfers. You can also add standard tags/keywords, such as your shoot identification, as you do the transfer. First, I don't know how long you'll be able to remember what 4-character file names represent. Second, I'd note that there are codecs easily obtained from the internet to allow Windows Explorer to display RAW files. Third, if you don't want to use Lightroom, you could use Bridge, or the free FastStone Image Viewer to quickly review your files, cull obvious rejects, and drag and drop files into folders. That's dirt simple. Then, you could import them into LR for further edits. If you are using a Windows PC go to "File Explorer Options" (you can type this in the search box). Go to the "View" tab & uncheck the "Always show icons, never thumbnails" option. This will allow you to see the preview jpeg thumbnail in Windows Explorer. I'm typing this on my phone so I can't check immediately but do you need to have shot your images in JPG to do this? I typically only shoot in RAW. Thank you! Sorry for the late reply, I am in Australia. I only shoot RAW, with Canons. Canon RAW files have a preview JPG embedded in the RAW, as do most others. I also have used Faststone image viewer for about 10 years or more & it also looks at the preview JPG embedded in the RAW. I have never used Bridge or Lightroom. I have always used Capture One which also previews the RAW JPG for culling etc..
Or just use Bridge to preview and organize your photos quickly. Once I found out about multiple selecting in Bridge and applying Camera Raw settings to more than one shot at a time, my workflow got much faster. 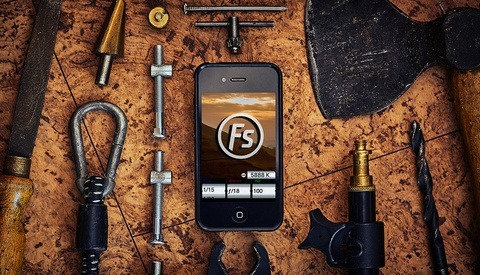 Far and away the greatest photo organization tool that was ever available was Apple's Aperture. Every thing else has been a bodge. Silly question, but Apple only? I haven't used it. Photo Mechanic is getting good reviews here but at $150 I think I'll pass.